Du Pont of Canada Ltd./Du Pont Canada Inc./Invista (Canada) Co.
Offices are located in Montreal, PQ, with home points of Maitland, ON (tank cars) and Sarnia, ON (covered hoppers). Reporting mark added 10/1965. Name changed in 1/1980. 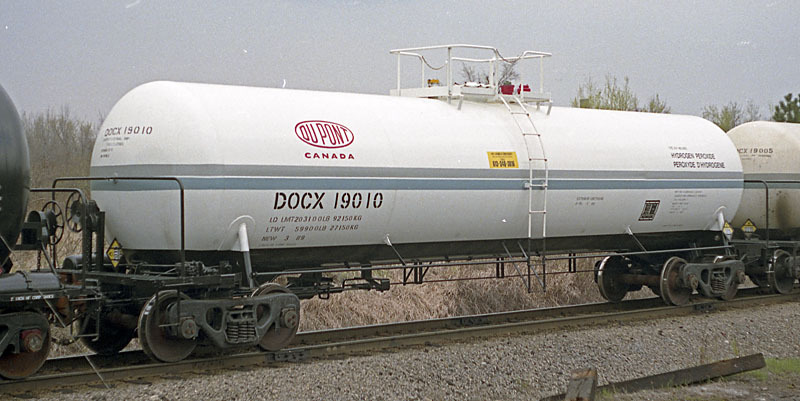 A number of tank cars were transferred to Degussa Canada Ltd. under DLPX reporting marks in 1999. Cars no longer listed from 4/2008 on, with the reporting mark eliminated in 10/2010. Data has been taken from the following ORERs (MM/YY): 10/1965-10/2008. ICC-105A300W. Motor fuel anti-knock compound svc. Hydrogen peroxide svc. xDUPX? ? /84. CTC-111A60W7. Hydrogen peroxide svc. re#DLPX 19001-19014 & 19015-19049 series /99+ & KCPX 19006-19010 & 19023-19041 series /99+. Hydrogen Peroxide svc. re#DLPX 19015-19049 series /99+ & KCPX 19023-19041 series /99+. DOT-111A60W7. Hydrogen Peroxide svc. re#DLPX 19015-19049 series /99+ & KCPX 19023-19041 series /99+. re#DLPX 19015-19049 series /99+ & KCPX 19046-19047 /99+. TC-111A60W7. Hydrogen Peroxide svc. re#DLPX 19052-19064 series /99+ & KCPX 19050-19062 series /99+. DOT-112S400W. Anhydrous Hydrogen Fluoride svc.